A&S Bagels is a wholesaler and retailer of authentic New York Bagels. The Definition of Wholesale: To buy at wholesale prices means to purchase large quantities of an item (buy in bulk) at reduced prices. Usually such purchases are made with the intention of re-selling or serving the product to the end consumer. Accordingly, A&S Bagels sells bagels in large quantities at reduced prices to other bagel stores, bakeries, hotels and other food service institutions. In turn, these bagel stores, bakeries, hotels, etc., resell the bagels to the end-consumer. A&S BAGELS OFFERS DAILY DELIVERY SERVICE: Daily delivery service (7 days a week) can be arranged for LONG ISLAND and NEW YORK CITY METRO AREA BAGEL shops, delis, bakeries, hotels and other food service institutions. A&S BAGELS OFFERS WEEKLY, BI-WEEKLY OR MONTHLY DELIVERY SERVICE: A&S Bagels can arrange for weekly, bi-weekly or monthly delivery service for most bagel stores, bakeries and food distributors in the continental USA. A&S BAGELS CONTACT INFORMATION: Your deli, bagel store, food distribution business can re-sell A&S Bagels. 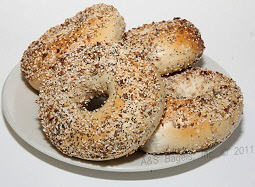 A&S Bagels sells our bagels in large quantities at reduced prices (wholesale pricing). If you are interested in purchasing bagels from A&S Bagels, please contact A&S Bagels at (516)326-9288. The below estimates are generally correct, however, please keep in mind your guests may eat more or less than average. 1. How many people does a 6 foot hero feed? Approximately, 21 to 24 people. 2. How many people does a 5 foot hero feed? Approximately, 18 to 21 people. 3. 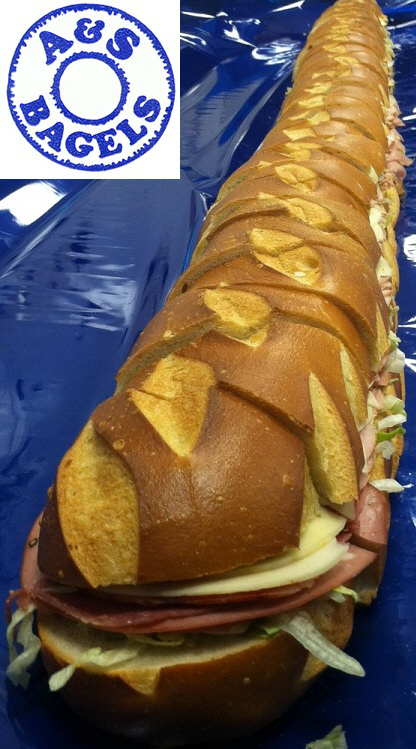 How many people does a 4 foot hero feed? Approximately, 15 to 18 people. 4. How many people does a 3 foot hero feed? Approximately, 12 to 15 people. 5. How many people does a party bagel feed? Approximately, 12 to 15 people.